Pomona is the fifth largest city in Los Angeles County, California (after Los Angeles , Long Beach , Glendale , and Santa Clarita ). As of the 2000 census, the city population was 149,473. In 2005, its population was estimated as 160,815. Pomona is the home of California State Polytechnic University, Pomona (Cal Poly Pomona) and the Western University of Health Sciences . Pomona College is in neighboring Claremont . The city is the site of the Fairplex , which hosts the L.A. County Fair and the NHRA POMONA RACEWAY Powerade Winternationals Drag Racing competition.and the Automobile Club of Southern California NHRA Finals. Since the 1980s, Pomona's newest neighborhood Phillips Ranch , experienced rapid growth with homes still being built in the hilly area between Downtown and Diamond Bar . Today, Phillips Ranch is nearly all residential. Northern Pomona has seen some gentrification with additional housing units added and revamped streetscapes. Pomona is located in between of Inland Empire and the San Gabriel Valley. View down San Jose Creek from Pomona Park. Pomona is a suburb of Los Angeles in the Pomona Valley, located at (34.060760, -117.755886). According to the United States Census Bureau, the city has a total area of 59.2 km² (22.8 mi²), all land. Pomona is approximately east of Los Angeles , north of Santa Ana , west of Riverside , and west of San Bernardino . Pomona is bordered by the cities of San Dimas on the northwest, La Verne and Claremont on the north, Montclair and Chino on the east, Chino Hills and Diamond Bar on the south, and Walnut , South San Jose Hills , and Industry on the southwest. The Los Angeles/San Bernardino county line forms most of the city's southern and eastern boundaries. The city is named for Pomona, the ancient Roman goddess of fruit. Supplied by horticulturist Solomon Gates, "Pomona" was the winning entry in a contest to name the city. The city was first settled by Spaniards in the 1830s and the first Anglo-Americans arrived in 1868. 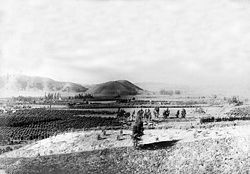 By the 1880s, the arrival of railroads and Coachella Valley water had made it the western anchor of the citrus-growing region. Pomona was officially incorporated in 1887. In 2005, Pomona citizens elected Norma Torres, the first woman of Guatemalan heritage to be elected to a mayoral post outside of Guatemala. City Hall Pomona, California, 1969, Welton Becket and B.H. As of the census of 2000, there were 149,473 people, 37,855 households, and 29,791 families residing in the city. The population density was 2,526.8/km² (6,544.3/mi²). There were 39,598 housing units at an average density of 669.4/km² (1,733.7/mi²). The racial makeup of the city was 41.76% White, 9.63% African American, 1.26% Native American, 7.20% Asian, 0.21% Pacific Islander, 34.93% from other races, and 5.01% from two or more races. Hispanic or Latino of any race were 64.47% of the population. There were 37,855 households out of which 49.8% had children under the age of 18 living with them, 54.7% were married couples living together, 16.3% had a female householder with no husband present, and 21.3% were non-families. 15.4% of all households were made up of individuals and 5.5% had someone living alone who was 65 years of age or older. The average household size was 3.82 and the average family size was 4.22. In the city the population was spread out with 34.6% under the age of 18, 13.0% from 18 to 24, 30.5% from 25 to 44, 15.5% from 45 to 64, and 6.4% who were 65 years of age or older. The median age was 26 years. For every 100 females there were 102.4 males. For every 100 females age 18 and over, there were 101.1 males. The total employment for Pomona as of 2005 is 57,870. The top employers include Pomona Unified School District, California State Polytechnic University, Hamilton Sundstrand, Pomona Valley Medical Center, Casa Colina Center for Rehabilitation, and Lanterman Developmental Center, and a large residential facility for persons for severe/profound developmental disabilities. The median income for a household in the city was $40,021, and the median income for a family was $40,852. Males had a median income of $30,195 versus $26,135 for females. The per capita income for the city was $13,336. About 17.1% of families and 21.6% of the population were below the poverty line, including 27.4% of those under age 18 and 11.7% of those age 65 or over. of Pomona and some of the surrounding area are served by the Pomona Unified School District, while portions of the northern section of the city are zoned to the Claremont Unified School District.Pomona has been criticized for its construction of Diamond Ranch High School in the city's more affluent area of Phillips Ranch while ignoring its other under-performing/moderate high schools such as (from most under-performing to moderate) Pomona, Ganesha, and Garey High Schools. Pomona contains a mix of both public and private schools. There are two private schools that are located on Holt Blvd, being St. Joseph Elementary School and Pomona Catholic High School . The School of Arts and Enterprise is a charter high school located on Monterey Ave. and Garey Ave.
California State Polytechnic University, Pomona (Cal Poly Pomona) is located southwest of the junction of the 10 and 57 freeways. The university was established on the site of breakfast cereal magnate W.K. Kellogg's ranch located on the city's western corner. The majority of the campus is not incorporated within the city. The university has over 21,000 students and covers an area of over , which makes it the second largest land-holding university in the California State University system. The university is known for its engineering and architectural programs which are very selective and nationally ranked. Western University of Health Sciences , (formerly known as College of Osteopathic Medicine of the Pacific) is located south of Highway 10 off Towne Avenue. It is one of the largest health sciences universities in California, offering degrees in Osteopathic Medicine, Veterinary Medicine, Physical Therapy, Physician Assistant, Pharmacy, Nurse Practitioning, and as of 2010, Dentistry, Optometry, and Podiatry. "Sugar" Shane Mosley - boxer, former Lightweight, Welterweight, and Jr. Middleweight champion. Current WBA Welterweight Super Champion.